They say the eyes are windows to the soul, and if that’s true, most people who wear glasses are double-paned. Especially for those with strong prescriptions for myopia or hyperopia (near and far sightedness), the thickness of the lenses can get extreme. The more common near-sighted prescription requires lenses to be thinner in the middle and flare out to greater thickness at the edges, creating the classic ‘coke bottle’ appearance. Farsighted, prescriptions, on the other hand, involve thicker lenses in the center. Both styles are unfortunately terrible for being seen through those thick glass or plastic lenses. Even very personable and friendly bespectacled people are often mistaken for distant and aloof simply because people aren’t sure when eye contact occurs. Fortunately, modern lens crafting has brought the glasses wearing community an amazing solution: thinner lenses with high-index refraction. Beauty can often be judged by the eyes alone. Simply appearing alert and interested can enhance the beauty of your eyes, but no one will be able to tell through thick, reflective lenses. From a distance, instead of seeing the beautiful shape of your eyes, all they see are a flash of lenses. Living life behind thick glasses can limit your social experience in a way no one will ever quite notice. 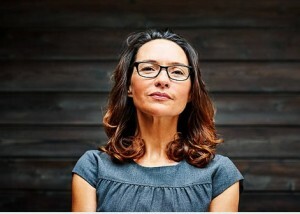 Many of the stereotypes of people who wear glasses may be based on a physical inability to completely meet their gaze rather than any personal or social inadequacies. You deserve to have your eyes seen by the world, and the world is missing out when your eyes are hidden behind thick lenses. Optical technology has been developing the high-index lens since the early 80s when plastics enabled the creation of lenses with a higher index of refraction compared to normal glass. The high-index material allowed them to bend light more efficiently through a thinner layer of material, creating much thinner lenses and opening the door to greater high-index lens development. In the decades since then, both material and lens crafting technology have advanced significantly, bringing you the modern high-index lens. The most advanced lenses are fifty percent thinner than your prescription with a standard lens. That’s fifty percent less material between your eyes and the world. The Index of Refraction is the difference in rate between how light travels through air and how light travels through a material. This ‘bends’ the light, which is the property used by lenses to magnify or shrink images for near and farsighted people. The higher the index, the more sharply the light bends when it hits the material. This means that materials with a higher index of refraction bend light more quickly, and therefore a thinner layer of material is needed. Normal glass has an index of 1.50, while the first high index polycarbonate lenses reached 1.59 and the current top index is 1.74. While high-index lenses are delightfully thin, they have not yet shed the need for matter entirely, therefore still reflect light. In fact, the higher index of refraction also causes the thinner lenses to reflect more light than usual. Because lens materials are not perfectly clear, all lenses block a certain amount of light which bounces away as reflections for any polished surface. High-index lenses are denser than usual, they block more light creating more complete reflections. This means that while your lenses are now thinner and easier to see through, that ease is negated by any beam or flicker of light that hits the polished surface at a reflecting angle. Fortunately, lens crafting has already thought of the solution. Wayward reflections cause more than just stray light beams. They are distracting when on your side of the glasses and downright impeding from the outside. When people look at someone whose glasses are reflecting, all they see is the light. No matter how thick or thin your glasses may be up close, reflections are difficult to see through and essentially opaque. Wearing shiny reflective surfaces can not only make it harder to see your eyes, it can also cause people to wince away from your gaze. Because no one wants that, anti-reflective coating has been an incredibly popular choice for all glasses wearers and comes included in many optical packages. The coating itself is an invisible layer of microscopic oxides that reflect and refract light in many different ways. This diffuses light as it hits your glasses instead of reflecting, causing improved visibility in both directions. You will be able to see out with fewer back-reflections and your friends and loved ones will finally be able to see your eyes. Because two separate and powerful optical technologies were developed, you have the best possible opportunity to visually connect with the people around you. Combining thin high-index lenses with anti-reflective coating creates a stunning, almost invisible effect and is the closest most with glasses can get to wearing stylish empty frames. After a lifetime of dealing with your thick lenses, you can sport the sleek styles usually reserved for people with much weaker prescriptions. To top it all off, this magical combination brings you glasses that not only reveal your natural beauty, they provide an increased amount of crispness and clarity when helping you focus on the world around you. Going out in your new glasses, prepare for some pretty surprised responses. Most people you know have not ever had the chance to really see your eyes, especially if you wear wide lenses for peripheral vision. The thinner lenses alone put less of a barrier between your gaze and theirs, allowing you to make a stronger connection with everyone you meet. Many people won’t even realize what exactly has changed about you, unable to reconcile the difference a little bit of advanced lens technology can make. If you want to make a game out of it, carry your old glasses around with you to help them understand the powerful effect of being able to see your eyes. Somehow, even though high-index lenses have existed since the 80s, almost no one knows about them or considers them a viable option. Once you’ve experienced the joy of having almost perfectly clear lenses, why not share this unique beauty secret with your glasses wearing family, friends, and acquaintances? Soon, every bespectacled person you know will be making the change and showing off their eyes. If the word spreads fast enough, it could be the most eye-revealing trend since contact lenses. Every day you spend behind thick or reflective lenses is one in which very few people actually see your eyes. You may think they’re looking at you, and it may feel like eye-contact from your point of view but the power of your gaze and the strength of your eye-to-eye connections are diminished by thick, reflective lenses. If you love your eyes, but not your prescription, you can finally have thinner, almost invisible lenses that will show off your eyes and give you excellent visual clarity. With this simple change, your personal connections will strengthen along with your impact on the people around you as they come to terms with what beautiful eyes you have, and that they’ve had no idea.